A completely new approach to 3D Secure. Simply reduce fraud and keep your sales on the right track. It’s up to you whether you accept only enrolled cards or turn on the possibility of accepting transactions even if a customer closes the 3D Secure window or provides a wrong PIN. Keep chargebacks in check and protect your payments with smart security layer. 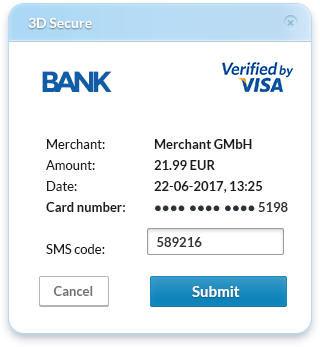 Use our flexible 3D Secure with superior UX to complete more transactions. 3D Secure (3-Domain Secure) gives extra cover to the online credit and debit transactions to prevent the fraud. Currently, this service is provided by Visa and MasterCard under the name Verified by Visa and MasterCard SecureCode, respectively. The key difference between our and competition’s 3D Secure approach lays in implementation. We don’t use redirections or annoying pop-ups, the authentication is displayed as an overlay. This helps us maintain the low chargeback ratio and increase the conversion rate. 3D Secure is no longer a “conversion killer” with our security settings that maximize your conversion rate and sales. With this solution, your chargeback ratio is reduced significantly and your conversion rate is on the same level before 3DS. It is a real game-changer in payments. With a non-invasive 3D Secure, you can turn on verification that requires both an enrolled card and successful liability shift, or allow completing transaction even if a customer’s card is not enrolled in the program or when a customer doesn’t provide a PIN or there’s a PIN error. Give an extra protection to each transaction made through SecurionPay. No matter what kind of integration you’ll choose – Checkout or Custom Form. Use custom HTML and CSS to create a payment form that meets your needs and add a non-invasive security option to protect your customers and streamline the payment flow. Provide quick and easy payments with an extra security layer that will take your business to the next level. Using our API you can turn on 3D Secure for specific transaction only. Use fraud score, IP, country, customer data and card’s metadata to decide if 3D Secure is required. It gives you more control and may save your conversion rate. Add a smart 3D Secure verification with superior UX to your transactions. Provide smooth and uninterrupted payment experience that doesn’t interfere with your conversion process. Enjoy the same security features on mobile as on desktop. Provide a smooth and seamless experience with mobile customers’ habits in mind. Offer extra items right after the initial purchasing is completed and watch your sales grow. Delay payments between authorization and capture processing and gain time to check the transaction against fraud. Payment form with simplified user flow. Automatically display payments translated into one of 23 languages, sell globally in 160 currencies and provide your customers with a local experience. Test it for free, increase your revenue and reduce chargebacks.